It’s early November now and not too late to get out of the city and look for some tasty edible mushrooms. I love Antonio Carluccio’s poetic description of mushroom hunting..he calls it “The Quiet Hunt” and this is a task best undertaken with an experienced guide to help you sort the delicious from the deadly. Failing that, I’d suggest going anyway, using two or three books in tandem to cross reference everything (there is a lot of conflicting information out there) and strange as it may seem for a foraging blog, I’d suggest you don’t eat anything you find, unless you can get someone very experienced to verify your ID. There is absolutely no harm in getting it wrong if the ultimate destination for you wild mushrooms is the compost heap not the frying pan, and this is an excellent way to build knowledge, gain confidence and stay safe, all the while giving an excellent excuse to get out in the woods. There really is not much I like better than to waffle on about wild mushrooms so this month I have made a short ( not so short at 22 minutes) film of myself doing exactly that and discussing how to ID four very distinctive late season edible mushrooms, all with their own very specific features to help find them and correctly ID them. I did this unrehearsed and in one take, the first take…bar a few coughs and some much needed tea drinking, I think it turned out pretty well and will give you all the information needed to hunt for these four mushrooms. The information I give only applies to the UK, further afield there may be other similar varieties that we don’t have here and with over a million fungi worldwide and 4-8000 ( depending who you talk to) types in the Uk alone, it is, quite literally, a mine field. 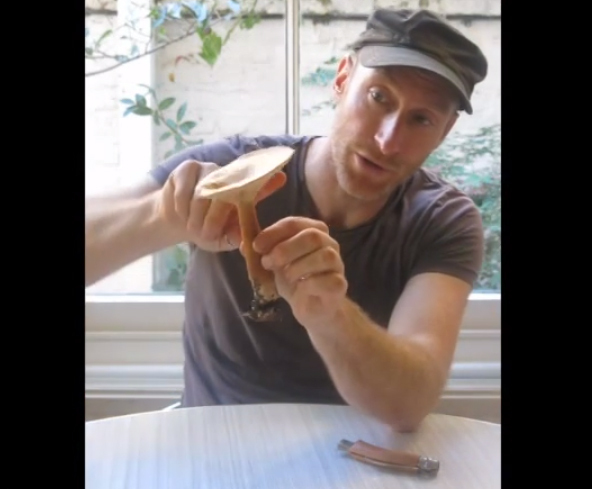 I hope you enjoy this little film and that it helps you to stay safe and have some foraging fun at the same time. If even one percent of one percent of doubt exists, do not eat anything you find, the risks are just not worth it. Click the photo to watch the film. Thank you for taking the time to put this video together. I’m learning all the time and find this video really informative. Next post: Crush Colds, Fight Flus, Vanquish Viruses & Combat Cholesterol.